This is the Gift Guide for the ladies in your life, whether that be your mother, sister, friend, auntie, cousin, sister-in-law or simply for yourself. I love reading Gift Guides for Her to help me write my Christmas Wish List, let alone shopping for my friends and family. Anyone else do this? Shopping for women can seem quite intimidating because there are just so many things to choose from. I've tried to include a variety of gifts to suit all ages, interests and styles, so that by the end you're festive shopping for her is all done. Be Ready - The Knight Stars (32.50euros) from Ju-Ju-Be - The classic yet contemporary pattern on this beauty case from Ju-Ju-Be is the perfect companion for nights away, visiting family/friends or simply storing your make-up/skincare in while at home. It will look stylish on the shelf either in the bathroom or bedroom and it folds flat for storage when not in use. Inside the beauty case you'll find ample room for all the products you could need for a trip away, as well as elastic loops for holding make-up brushes/mascaras/toothbrushes and mesh pockets for organisation. The Be Ready beauty case is available in a wide range of patterns and there are plenty of matching accessories to add to your collection too. The Happiness Box (£54) from Little Bird Gifting Studio - If you're looking for luxurious, thoughtful and extra special gift boxes for a loved one or friend this Christmas then look no further than Little Bird Gifting Studio. The lovely founder, Ruth, works extremely hard to source the highest quality products and specially curate gift boxes that can be sent out to the special people in our lives. Their range of boxes include The Joy Box, The Sanctuary Box, The Man of Taste Box, The Welcome Little One Box and The Rose Box. Not to mention The Happiness Box, which can be seen here in all its beauty. The high quality and sturdy wooden box not only holds the luxurious range of items, but also has so many uses after the recipient has excitedly emptied it of it's contents. It could be a keepsake box, place to store bath products, for love letters, letters to your little ones etc. ; the possibilities are endless. Inside the Happiness Box you'll find a Wildheart Organics Happy Candle, Wildheart Organics Life+Soul Room Spray, Fil Blanc Hamman Hand Towel and Pumpstreet Chocolate Sourdough and Sea Salt 66%. When you open up the gift box you'll be hit be greeted by the aromas of rose, ginger lily, geranium and bergamot from the candle and room spray, which is the nicest way to start your discovery what is inside. It's the extra thought that goes into choosing each item that is evident straight away, everything from the hand poured aromatherapy candle to the organic room spray made with 100% essential oils and the small batch award winning chocolate made in Suffolk. This gift box contains everything you could possibly need to create a sanctuary of happiness at home and one that will last a really long time too. Bowline Jacket in Rose Pink (£59.95) from Lighthouse Clothing - There's no denying that the wet and cooler days of autumn/winter are upon us now, so giving the gift of a jacket this Christmas will help keep your loved ones dry and warm. Lighthouse Clothing have a wide range of coats, jackets and clothing for men, women and children, all of which is the highest quality, stylish yet practical and there's something for every weather. The Bowline Jacket is the perfect transitional piece from summer to autumn or winter into spring because it is lightweight, waterproof, windproof and has cotton lined adjustable integral hood. This is a modern twist on the classic rubberised raincoat and is available from a size 8 to 20. There are two large pockets on either side of the jacket and the combination of a zipper and popper fascinations works well to keep the cold wind out. Personalised Wildflowers Seed Kit (£25) from The Little Picture Company - This is the gift for the gardener in your life; a luxurious botanical kit that contains four different seed tins. Each seed tin contains a different collection of seeds, including the Bee Mix, Herb Mix, Butterfly Mix and Tea Mix. There is the potential for hundreds of flowers and plants to grow from this one Wildflower Seed Kit, which could truly transform the lucky recipients garden. Some of the seeds need to be grown indoors and some outdoors, which allows for them to be enjoyed all year around. The larger tin that the kit comes in has a delicate floral pattern on, says 'Thank you for helping me/us grow' and then you can personalise the name and who it is from. It would be a really special gift for anyone who loves spending time out in the garden and the seedball tins included ensure that they don't need to be a flower expert to be able to fill their garden with wildflowers. Premium Roast Coffee in Creamy Caramel and French Vanilla (£15 each) from Beanies - Beanies are probably most well-known for their incredible range of flavoured coffees, everything from Choc Chip Cookie to Caribbean Rum and Crème Brulee. Their Premium Roast collection of flavoured coffees are for the dedicated coffee drinkers with a range of strengths, blends and grounds. The Premium Roast collection has over 20 flavours to choose from, so you'll be sure to find a flavour that suits the person you're buying for. Each flavour can either be caffeinated or decaffeinated and then you can choose the grind from espresso, medium grind or whole bean. Beanies coffee is one that will fill the room with its scent, yet somehow isn't overpowering. The Creamy Caramel and French Vanilla are dreamy served with single cream for a real treat on a cold winters evening. Personalised 'Love you always' Candle (£32) from norma&dorothy - Lighting a candle on these cosy dark evenings is such a lovely way to end the day and norma&dorothy's range of personalised candles really do have that extra special touch. There are candles with monograms, floral patterns, in loving memory, family Christmas, couples Christmas and teacher gifts to name a few. The elegant matte white glass has your personalised messaged etched into it and then is filled with a scented natural wax that burns for up to 40 hours. You can not only personalised the names on the norma&dorothy candles, but also choose the scent of the candle too. There is a scent for everyone including: Cassis & White Cedar, Orange & Cinnamon, Sandlewood & Amber, Tranquillity and Velvet Rose & Oud. When the candle is lit the message shines brightly giving it a unique finish and a cosy feel. The Cookery Book Club (£44.99) for a 3 month subscription) from The Willoughby Book Club - Subscription gifts are the gift that really does keep on giving, making it exciting for many months after Christmas Day itself. The Willoughby Book Club have a wide range of book subscription gifts, including for babies, toddlers, children, classic books, contemporary books, gardening, natural history, young adults and couples. Their Cookery Book Club is available to buy for 3, 6 or 12 month subscriptions with each month a new recipe book being delivered to the recipient based on their cuisine preferences. When you order a subscription you will be asked for their three favourite cuisines, choosing from Italian, French, British, Asian, Mediterranean, North & South America, Contemporary, Baking, Vegetarian or Seafood. The first package comes with a personalised message to make this an even more thoughtful gift and each month the book is carefully wrapped in tissue paper for that extra special touch. Rhubarb and Ginger Gin Liqueur (£23.45 from amazom) from Jawbox- Gin's popularity has boomed over the past few years and so has the Gin Liqueur market. Their interesting flavours, lower alcohol content and stylish bottles make them a favourite drink choice for many. Jawbox Rhubarb and Ginger Gin Liqueur combines the classic flavours of sharp rhubarb and warming ginger for a perfect balance of flavours. It's the base for cocktails that can easily be made at home, ideal for all those dinner parties over the festive and new year period. If you're willing to share that is! This gin liqueur is such a refreshing choice when mixed with rose lemonade and lots of ice; personally, my favourite way to enjoy it. Flavoured Pretzel Bites (from £5 for 5 bags) from Indie Bay Snacks - Indie Bay Snacks was started when a real need for a snack that was both satisfying and delicious without the grease. This is when the Pretzel Bites were born; taking the best part of a pretzel and making it into an incredibly moreish snack. They come in five different flavours, including Cracked Pepper, Smokin' BBQ, Easy Cheesy, Superseeds and Rock Salt. All of these flavours are made from natural ingredients, a good source of fibre, contain no trans fat, source of protein, GMO free and are vegan. A unique aspect to this brand is that with every bag they sell they give back, focusing on educating children about healthy food. You can buy them in Sainsburys, Whole Foods Market, Sourced Market, Ocado, Daylesford Organic Farm, Planet Organic and on their website to name a few places. Christmas Roast Dinner Box (£21) from Ross & Ross - Do you know someone who loves to cook an incredible roast/Christmas dinner? Ross & Ross have created a Christmas Roast Dinner Box, which is filled with different ways to take anyone's roast dinner to the next level. Inside the box you'll find Roast Potato Oil, Pigs in Blankets Dust, Brussel Sprouts Dust and a Roast Turkey Rub, all of which work together in harmony to create a roast dinner like never before. The Roast Potato Oil is Cotswold Rapeseed Oil infused with Smoke, Rosemary and Garlic, the Pigs in Blanket Dust is sweet and spicy, while the Brussel Sprouts Dust is a fragrant spice blend and the dry rub for your Turkey or Game is an easy way to pack in more flavour. Two Night Country House Escape for Two (£299) from Red Letter Days - Escaping to the countryside is the perfect place to a mini break and relax. Red Letter Days have a wide variety of short break experiences to suit everyone, including glamping, boutique retreats, spa breaks and luxury hotels. Their Two Night Country House Escape for Two voucher comes with a choice of 26 locations across the United Kingdom, including Cumbria, Dorset, Cornwall, Somerset, Kent, Moray, Gloustershire and Hampshire. The voucher experience includes two nights away with breakfast, so you really can relax in the countryside. We were lucky enough to visit The King's Head Hotel in Cirencester, which is one of the hotels you can choose from when you purchase this voucher and we were blown away. The hotel has so many luxurious touches, the breakfast was one of the best I've ever had and the customer service was outstanding. If you want to see more our adventures in the Cotswolds and at the hotel, then there is a vlog of our break over on my IGTV. The King's Head Hotel is also the perfect choice if you want to take children with you because you can pay an additional £30 per night for a child's bed and you can have up to two per room. Lime, Basil and Mandarin Candle Making Kit (£21.99) from Cosy Owl - Making your own candles is not only a way to learn a new skill, but also one that you will benefit from for months to come. Cosy Owl have a whole range of different scented candle making kits, including Sweet Strawberry, Fresh Linen, Calm Ocean and Vanilla. Lime, Basil and Mandarin has a fresh, crisp scent and this Candle Making Kit contains everything you'll need to make five candles. The Kit includes: 800g Paraffin Container Wax, 50ml of Lime, Basil and Mandarin, 3g Cream Bekro dye, 5x LX 16 wicks, 5x 20cl Karen round glasses, 5x silver lids and 1 easy to follow guide. You could either gift the kit as it comes or even make the candles yourself to give to your loved ones as a homemade gift. Also, if you enter 'WELCOME' at the checkout you will get 10% off your order. Overdid It On The Gin Kit (£25) from Men's Society - During the festive period the social events are a plenty, which can leave you feeling rather 'fragile' the next day. This Kit from Men's Society is the ultimate survival kit, including restorative Bath Oil, nourishing Eye Cream, refreshing Marvis Toothpaste, a cosy sleep mask and travel friendly toothbrush. It's all the lucky recipient needs to run themselves a relaxing bath, brighten up their tired eyes and generally freshen themselves up ready for the next day. The gift for anyone who loves gins, late nights or just needs a bit of pampering. All of the items comes in this cute tin, which can be reused for storage once all the products are finished. Large Two-Wick Square Candle in Amaretto Apple (£23.99) from Yankee Candle - Yankee Candle always come out with new and festive scents on the run up to Christmas and this year is no exception. Alongside their classic fragrances they have added new ones, including this Amaretto Apple, which reminds me of an afternoon of warm winter apple baking. The baked apple, amaretto, cinnamon, vanilla and sugar notes all work in harmony to create a candle that quite truly fills the room with a warming scent. This range of square candles (available in Small and Medium too) have an innovative design because once the lid is removed to burn the candle it fits perfectly underneath the candle to act as a stand. Which is your favourite gift for her this Christmas? Some fantastic recommendations here. I know just the person for that Gin Kit!! I love those wild flower seed kits, they are so lovely. The rhubarb and ginger gin also looks great and I love those candles! Lovely selection of gifts, I would be more than happy to find any of these under the Christmas tree for me. Love the wild flower seed kits from The Little Picture Company, beautifully presented and something that can be used in a way to help nature. So many lovely ideas, I love a candle. You can't go wrong! I am loving all the gift ideas here. I love the candles a lot. 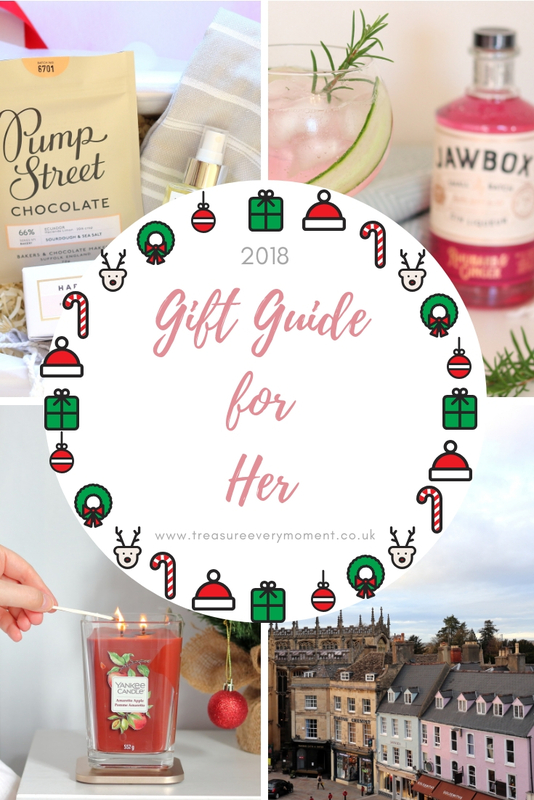 My mummy wants EVERYTHING on this gift list especially the Jawbox Rhubarb and Ginger Gin Liqueur! AMAZING! I love the seed mixes! So different - a brilliant idea! What some gorgeous gifts, I'd love the Country House escape. I also love the Wildflower seed bombs. Oh so many fab gifts! I love the candle! These are all such gorgeous and unique ideas! I especially love the wild flowers, I've never seen anything like that. I absolutely love the wide range you have included. For me the bowling jacket in that soft pink looks beautiful. I would really love a break away though as I’ve not been on a holiday since 2017. There are so many lovely ideas hereto suit all budgets. I would love to be treated to the two nights away package, i'm also intrigued by the sprout dust. A country escape is always high on my list but wouldnt mind receiving any of these. It would have to be the Yankee candle for me, there is a wide variety of gifts here. Your post came at the perfect time, I've been wracking my brain to think of something to get for my mum and that book club subscription is perfect! Great ideas! I love the new Yankee candle but I’m a big fan of Ross and Ross too!! Wow, so many beautiful ideas. I'd be happy with any of them! Some great gift ideas! That gin Liquer sounds right up my street!